According to research, over half of retailers (53%) will focus on using technology to improve the retail experience in 2018. Shoppers are also ready to embrace more technology in retail. A survey found that 76% of consumers had a better in-store experience when retail employees used technology. Furthermore, 67% of consumers stated that, when retailers use mobile technology, they were able to save time. Given that both retailers and consumers are in agreement that using technology can improve the retail experience, the weight is on retailers to provide the necessary tools to facilitate this shift in thinking. It’s natural that emphasis will be placed on in-store technology since that is where customer interaction takes place. However, back office technology plays an equally important role in improving the retail experience. An efficient and organized team is the lifeblood of any retail business. Your retail business won’t survive for very long without trustworthy and efficient employees. Research shows that most retailers believe that achieving better in-store experience centers around their workers. There’s no denying that an efficiently managed workforce will have a positive impact on your bottom line. This is where using the right workforce management solution comes into its own. Eliminates payroll errors – Understandably, employees will be unhappy if they have kept their end of the bargain by showing up to work and being productive, but then find that there are errors in their pay because of scheduling mix-ups. Workforce management software removes the potential for payroll errors because it automates timekeeping functions. Deputy’s Kiosk takes the guesswork out of employees’ shift times by capturing their start times on your iPad. If your workforce management software is integrated with payroll, your employees’ working hours will be used to automatically update payroll. When employees receive their correct pay, they’re more likely to remain motivated and provide better customer service to your customers. More accurate analytics – You need to be able to identify trends in your retail business in order to be able to make projections and plan for growth. It can be difficult to know when you’re overstaffed or understaffed with manual scheduling. Using workforce management software – with an effective reporting function – enables you to forecast how many employees you need for specific seasons. The software you choose should provide the functionality to create custom reports from data, such as timesheets, schedules, and employees. Accessing and utilizing the appropriate analytics through your workplace management software can improve the retail experience because you’ll be in a position to match the peak time of your business with the right number of staff to provide better customer service. Compliance with laws and regulations – Like most other businesses, retail needs to maintain accurate records to provide evidence that they’re complying with local and federal laws. Your retail business may also need to provide information about your working practices to employees, their representatives, and unions. Failing to provide accurate proof that you’ve complied with the relevant legislation can lead to your business being fined. One area where an automated workforce solution will be invaluable in keeping your business compliant is predictive scheduling laws. Download Deputy’s guide on these laws and regulations to get your business fully compliant. It’s predicted that 1.9 billion smartphones will be shipped globally by 2021. This growth in the use of mobile devices has seen more retailers adopting mobile point-of-sale systems (mPOS) to improve the retail experience. mPOS systems are where mobile devices can be used as a cash register as a replacement or connection to an online point of sale systems. Apple Pay is probably one of the most well-known mPOS systems today and is responsible for making this type of payment more acceptable to consumers. mPOS systems are now more than just payment terminals. They also serve as a way to enhance customer engagement by integrating with back-end processes, like inventory, for a more holistic retail management function. Customer convenience – mPOS systems also reduce the time that customers stand in line, which is one of the biggest complaints when shopping in a retail store. Customers will sometimes leave an item and the store rather than wait in a long line. With mPOS systems, such abandoned purchases can be a thing of the past. Your employees can meet the customer where they are in the store and pay for the item without ever having to wait in line. If customers know they don’t have to allocate time to wait in line, it’s likely that they’ll spend more time looking for products to buy. Customer rewards – mPOS systems integrate with customer loyalty programs, gift registries etc. It’s not unusual for customers to do price comparisons on their mobile devices while in-store. When mPOS is integrated with a loyalty program, you can provide the customer with a personalized offer to match what they’ve found online. Providing the customer with loyalty points on the item increases the chances of a sale. 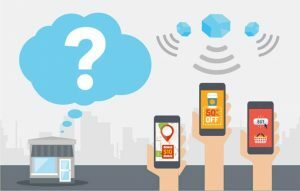 Beacons over Bluetooth are another example of how retailers are using mobile technology to improve the retail experience. Bluetooth Low Energy (BLE) beacons are little electronic devices that occasionally broadcast radio signals using Bluetooth signals. Where a customer has the store’s app on their phone, they’ll be able to interact with the beacon. It’s estimated that the Bluetooth beacon market will grow to over 400 million shipments by 2021. Personalization – It’s reported that 90% of consumers use a mobile device when shopping and 54% use smartphones to compare prices. When consumers download the retailers’ app and opt-in to receive updates, retailers are able to offer personalized offers via Bluetooth beacon technology. When the customer is in the store, the Bluetooth beacon will send notifications to the app (depending on the customer’s location in-store). An example of this could be providing style recommendations depending on the clothes section that the customer is in. In-store operations – Bluetooth beacons can help to check foot traffic in-store. Beacon systems can record the number of Bluetooth devices in different areas of the store at different times. This data can be provided in real-time, so managers can relocate employees to the busiest parts of the store. Additional valuable information about how long people spend in different parts of the store can also be collected. This will help retailers to determine which products are the most popular and which items need extra marketing attention. The analytics from Bluetooth beacons can inform decisions in relation to the arrangement of the store or staff scheduling. Interactive digital kiosks are stand-alone touchscreen pods that display interesting and engaging information. 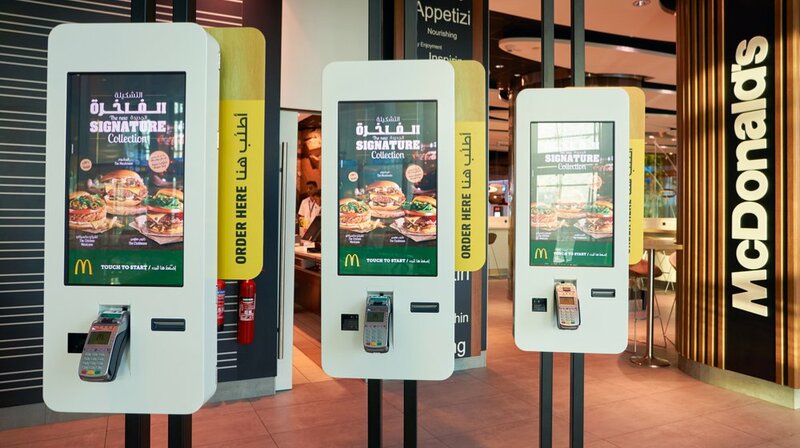 As well as providing information about retail businesses, digital kiosks can also be used for self-ordering (as is the case of McDonald’s). Digital kiosks is a technology that improves the retail experience, not least because it provides a way to allow consumers to interact with your store in the way that most of them are used to, which is through a digital device. Increases employee productivity – Employees can spend more time with customers instead of answering the same queries over and over again. Digital kiosks can be programmed with frequently asked questions that shoppers can access at their own pace. This type of self-service may be better suited to some customers as they may feel less pressure to buy when interacting with the kiosk instead of speaking to an employee. Using a digital kiosk takes care of routine queries and tasks to free up your employees to concentrate on tasks that have a direct effect on increasing sales. Increases interaction time – Shoppers are used to spending huge amounts of time on their phones, so it’ll come as second nature to spend time on a digital kiosk. The longer the interaction time, the higher the likelihood that consumers will be invested in your retail store. Placing an interactive kiosk that’s informative and fun in your store you encourage familiarity and trust, which may result in additional sales. Informs behavior analysis – Data from the digital kiosk can be used to improve the retail experience further. When a shopper uses the digital kiosk, certain key information is collected automatically. This method of data collection is more accurate and less time-consuming than information that’s provided via customer surveys. Retailers can use the data from the digital kiosk to increase sales and decide which business areas are in high demand and where the majority of your profits come from. The useful data collected from digital kiosks give a valuable insight into your customer’s behavior at a fraction of the cost of hiring a market research firm. Despite the growth of online shopping, consumers still want to visit stores. However, the stores that will attract and keep shoppers are those that use technology to improve the retail experience. The latest technology must be supplemented by knowledgeable and motivated staff to provide the highest level of customer service and to drive sales. The combination of automated software that manages back-office functions and in-store technologies enable retailers to keep employees and customers happy for a retail experience that continues to be improved. Is your retail business future-ready? 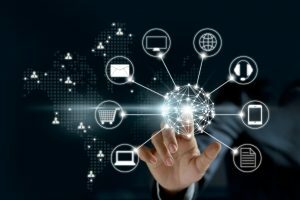 Deputy connects businesses and employees seamlessly through technology to make work easier. Sign up and get your free 30-day trial here. The post Four technologies to improve the retail experience appeared first on Deputy.